This year for my 22nd birthday, I asked my parents for a trip to Greece. 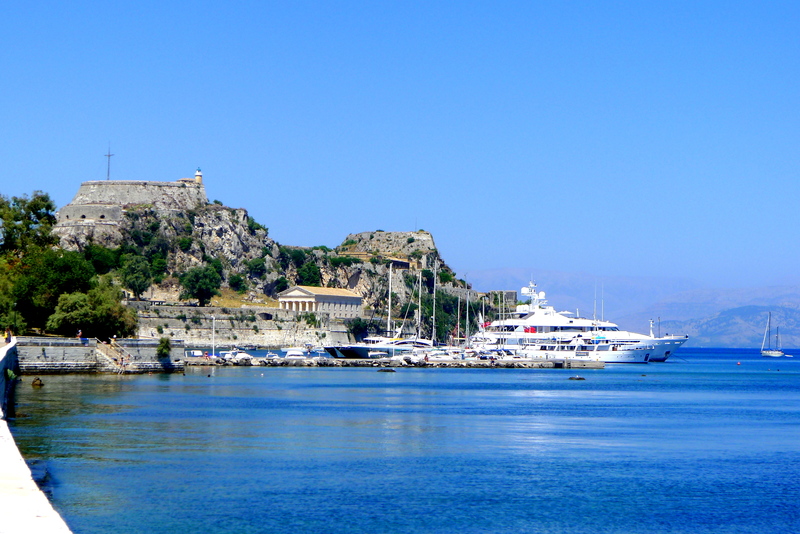 My parents were okay with paying for the flight as long as it was cheap- so off to Corfu I went for 130 euros. For the first three nights I stayed at the Pink Palace – an infamous party hostel I had heard about for years. The hostel was everything I expected; rowdy, alcohol-stained and full of Canadians. I had rightly assumed I wasn’t going to learn anything about Greece there (besides the shots of ouzo I was being handed left and right) so I checked in advance for Couchsurfing hosts in Corfu. A few days before I left, a girl named Marina accepted my Couchsurfing request. She seemed like a fun, well-read and overall, trustworthy Greek girl. I decided the plot of Hostel happening to me was unlikely so I decided to stay with her. I had no idea how to Couchsurf- but hey, what’s travel without some new experiences? Staying with Marina was better than anything I could have hoped for. She took me out for cocktails at a bar next to a Greek fortress. She introduced me to all her friends. She taught me how to pronounce all the names of the Greek gods and goddesses in Greek (I’m a nerd, yes). She made me pasta with her dad’s homemade olive oil. She took me out for ice cream topped with the ever-ambrosial Greek honey. To top it all off, she basically brought me back from the dead. I had tonsillitis and a fever of 103 degrees while I was staying with her (this may have had something to do with binge-drinking at the Pink Palace for four days). She not only took me to the hospital and the clinic, she also made me teas with her magical Cretan herbs. She even gave me the one fan in her house to use during the 110 degree nights. 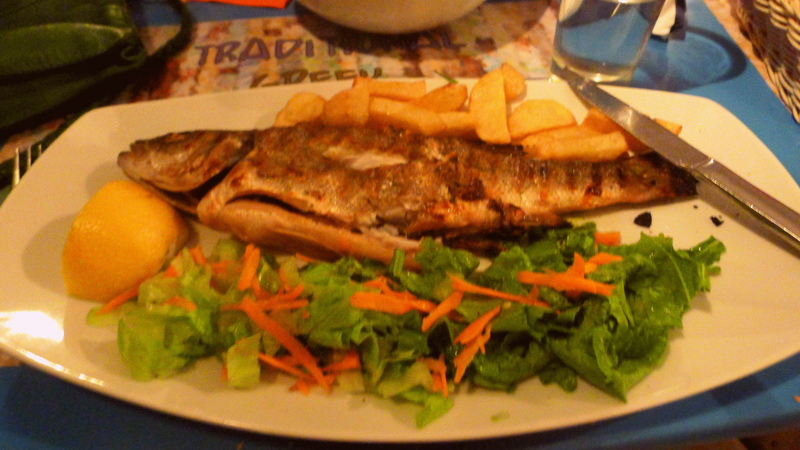 Crispy-skinned bass on a breezy Greek night. Heaven. By the end of it I was petitioning for Marina to become the new patron saint of the island. This review of Couchsurfing may be a bit premature (advocating staying with strangers after one experience) but the concept is so brilliant- stay with a local host for free and learn all about the local culture. And make lots of friends. Here are some tips to have a successful Couchsurfing experience yourself. All you have to do is create and build up your profile and then send out Couchsurfing requests. 1. Have at least one profile picture, but having two or three is better. 2. Fill out your profile. You want to seem trustworthy and like a real person. 3. Check the reviews of whoever you’re staying with. 4. Check to see if your friends already have accounts (use the name search). They can provide you with your first references. 5. Use good judgment. As a solo female traveler I will only stay with a female host. 6. Make sure you review your hosts and your host reviews you- the more reviews the better. 7. Go to the couchsurfing events to meet people. 8. If you enjoyed your time with your host, add them as a friend. That way you can keep in touch with them and they can keep in touch with you, in case either of you are in the same city again. Have you ever couchsurfed? Would you consider trying it? First of all… Thanx a bunch for stopping by my blog. You were my first real comment from someone I don’t know in real life and only my second comment including real life friends! Where on Earth did you get a flight to Europe for 130 euros? That sounds like a steal! I know jealousy is a bad thing… but I am soooo jealous! It looks like you had a fab time; minus the tonsillitis and fever. I can’t wait to be trying the Greek honey topped ice-cream and seeing those beautiful views for myself! You definitely appear to make my girlfriend’s fears of Couch Surfing look a little unfounded, even if you’ve only had one experience with it so far. I think your website looks great… I’m jealous of your blue background (wow I’m just the jealous type, huh?)! My theme, believe it or not, wont let me easily change my background without changing the post background color too. My page looks so white and blah, lol. Hey! Thank you for stopping by. I actually was already in Europe when I got that ticket (working in Paris) so I flew with Ryanair from Belgium to get to Greece. I think your site looks great! Very minimalist which goes with your theme anyway :). And yes, I still have a lot of work to do on the other blog but I will work it out hopefully soon. And also thank you for pointing out all the interface problems, web design isn’t my specialty so I have a bit of trouble! Keep in touch. My impression of Couchsurfing is always a work in progress but I’ve found the community to be largely openminded, adventurous and curious. Its a tool at the end of the day. For me the best experiences I’ve had have been organic and spontaneous, it almost feels like conjuring magic which I feel CS can sometimes take away. Its mostly a trick of the mind – A connection is a connection and fun is fun right? That said, anytime an adventure has begun with strangers met on the street they’ve usually been CouchSurfers anyway because of the aforementioned attributes. Yeah I know what you mean. I’ve had good experiences either way, but CS is certainly a good way to guarantee a place to stay as well as a local connection. Either way it’s great to meet like-minded adventurous and curious people! I am a CouchSurfing fiend! I think I have surfed in every-single-country I have travelled to. It’s a much better way to travel. Oh that’s so cool, I’m jealous! What a great way to meet people. I need to do it more often! So, I’ve never surfed, but living in New York City I get requested to host all the time and I love it!!!! I have yet to have a single bad experience and have only ever met lovely people. Our currently couchsurfer is from very north Finland, and lives on a reindeer farm her parents own…how else except through CS would I ever meet someone that interesting! Can’t wait to start surfing myself. Wow that’s so cool! I’ve actually never hosted so that sounds really fun. It would be a great way to build contacts all over the world and hear interesting stories! I’ve done it since and have had a great time on both occasions! It’s such a great way to travel. We still have to try couch surfing….Somehow, I feel that I may end up being an inconvenience to the host…and feel guilty as I am not paying! I need to overcome that feeling someday!